A team of NYSCF scientists demonstrated that small volumes of cryopreserved peripheral and cord blood can be reprogrammed efficiently in a convenient, cost-effective, and scalable way. 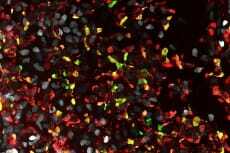 Further, the scientists developed induced pluripotent stem (iPS) cell colonies 2-3 weeks faster than previous reports. The iPS cells derived were also transgene-free, meaning they did not have genomic rearrangements. This method, published in Stem Cell Reviews and Reports, enables the reprogramming potential and, therefore, potential for use in research and future treaments of innumerable limited biobanked blood samples, including those from children and newborns that cannot easily provide larger blood samples.